Magento 2 Shop By Brand extension is not only a search option for your shoppers but also an effective method to advance your branding. Besides searching by brand attribute, A brand list is created to show brand logo for the visitor to choose from. Hence, with Magento 2 Shop By Brand extension, your shoppers will be delighted which leads to the increasing of sales on your store. Magento 2 Shop by brand is really necessary? Nowadays, Branding is essential for a company to attract customers. For instance, in the car industry, everyone will notice when there is a Lexus or Audi car on the road. Or in fashion, Burberry, Dior, and Louis Vuitton have done very well to bring their brand to the top luxury. It is a fact that no matter how good your products are, branding counts 70% of the success of your business. From that point, people’s awareness of one brand has become important as well. Shoppers continuously choose their favorite products based on their brand. To make your shoppers comfortable on your store site, Magento 2 Shop By Brand is completely needed for your site. Magento 2 Shop By Brand extension will create a nice Brand Listing page for shoppers to view. Hence, shoppers can choose their favorite brand and click on the brand logo. From that point, shoppers will be navigated to the brand page with detail information and products. Searching products by brand is in an entirely new level to visitors. Magento 2 Shop By Brand extension will generate a brand listing page for shoppers to view. The brand will display logo only and when shoppers click on a logo, they will be redirected to the brand page. With Magento 2 Shop By Brand extension, you can configure to display the brand logo on the product's detail page. This will raise your shopper’s awareness about the brand and which brand that product belong to. A logo is not the only item that will describe a brand. Magento 2 Shop By Brand allow store admin to create a brand page with all detail about the brand and its features. Hence, even if your shoppers do not know one brand on your store site, they can always do a research on it and take its products to try a new brand themselves. Magento 2 Shop By Brand provide you an amazing feature to filter products by a specific brand. Once your shoppers click on a logo in the brand listing page or on the product detail page, they will be redirected to a page that contains the products of the brand. A menu in the sidebar will be created for your shopper to easily find the brand. 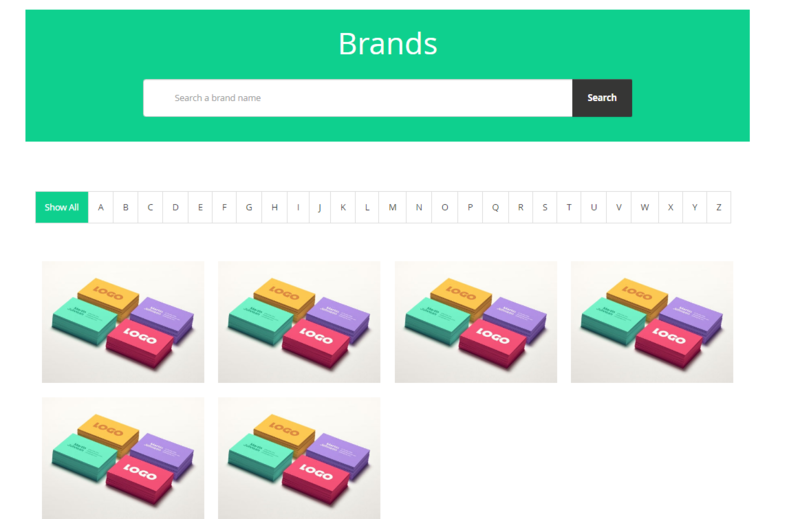 The brand menu may include featured brand, brand categories, search by brand box, etc. Store admin can also configure the brand menu style in the backend. Magento 2 Shop By Brand extension assist you on deciding which manufactures to display on the frontend. Because some brands might not want their name on other stores, you can limit the number of the brand as what you wish for. With SEO-friendly URLs feature, you can optimize the URLs of a separate brand or for all brand pages. Moreover, custom meta tags are also can be added to enhance your site SEO. With the optimized URLs, your shoppers will have to wait less for the loading page. What if your store has thousands of brands and you do not know how to effortlessly add all of them into your store? Magento 2 Shop By Brand allow you bulk importing all of the brand data such as brand images, brand logo, brand description, etc into your Magento 2 system at once. All brand data will be imported from CSV file and automatically adapted into the system. Hence, you will never have to worry about the manual work again. Gifting a Green Card - Is It True? What is Shop by Brand for Magento 2? How to use Magento 2 Shop by Brand? I've written about brand loyalty and things that get me to love a brand that I ... café, I deal with guests having a lot of feedback about the shop and our products, ... job roles for their staff and a loss in translation from brand to consumer.